If I previously found drops and streams of modern fantasy in George MacDonald's Phantastes (1858), in his children's book The Princess and the Goblin (1872) I seem to have found the headwaters. It makes sense that the fantastic imagination had more room to roam in children's literature at the time. Today's resurgence of YA sf/f (see the flap about the YA-heavy Hugo novel nominees in 2009) shows this cycle continuing. And of course, J. R. R. Tolkein wrote The Hobbit before he tackled The Lord of the Rings. Indeed, if you've read The Hobbit to your children but they're not quite old enough to head off for Harry Potter or LotR yet, pick this one up. It strikes many of the same notes, and has aged quite well. Irene is a princess (a true princess, not spoilt at all), and she lives in one of her father's country houses. There's the household and retinue, and out in the mountains there are miners and (unbeknownst to the princess) goblins. Irene discovers her magical grandmother living in parts of her house that are only there sometimes. None of the rest of the house knows about the grandmother, and even Irene sometimes thinks she dreamed it all. However, she is true to her word and believes in herself, and the grandmother gives her a magic ring that will see her through troubling times to come. Curdie is a brave young miner, a little older than Irene. He rescued her when she stayed out too late one night. He discovers that the goblins have hatched a plot against the miners and the King's men. However, in his spying he eventually gets captured by the goblins. 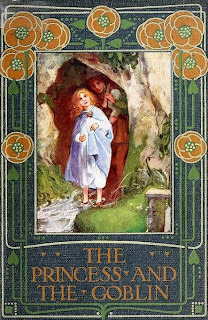 Irene, following a thread (that neatly ties the plot together, literally and metaphorically) from the magic ring, finds Curdie and rescues him. He's very grateful, but doesn't believe in the ring or the grandmother, which he can't see. Irene is very vexed with him. Curdie continues spying on the goblins, but is then captured by the King's men. They don't believe him any more than he believed Irene. However when the goblins overrun the house he escapes and helps drive them back. He knows their two weakness: recited poetry (much simpler than the lyrical verse found in Phantastes, same comparison between poetry in Hobbit vs LotR) and very tender feet. Goblins don't have toes (although their Queen does, and she's very self-conscious about it). And they've lost any and all creativity, so the creativity of others causes them pain. The princess had already escaped the goblins of her own accord, but she gets stuck with Curdie and his (very noble) parents for a while. Eventually they make it back in time to present her to her father, who had finally ridden in with his men in response to the emergency. There's one more crisis before the end, but Irene's nobility and Curdie's leadership see everyone through safe and sound. My description makes it sound a bit trite, but there are some interesting elements here. For one, Irene rescues Curdie, and there's a lot to be said for that. Also unusually, there are three strong women here: Irene, the mysterious grandmother, and Curdie's mother. Another prominent, although a bit flibbertigibbet figure is Irene's nurse. Amazingly enough, this short novel from 1872 passes the Bechdel test with flying colors in that Irene speaks to all the other women about things that aren't boys or men or Curdie. Considering how few modern narratives can say the same, I found this quite refreshing. There was a legend current in the country that at one time they lived above ground, and were very like other people. But for some reason or other, concerning which there were different legendary theories... and the consequence was that they had all disappeared from the face of the country. According to the legend, however, instead of going to some other country, they had taken refuge in the subterranean caverns, whence they never came out but at night... Those who had caught sight of any of them said that they had greatly altered in the course of the generations; and no wonder, seeing that they lived away from the sun, in cold and wet and dark places. They were now, not ordinarily ugly, but either absolutely hideous, or ludicrously grotesque both in face and form... The goblins themselves were not so far removed from the human as such a description would imply... as they grew in cunning, they grew in mischief, and their great delight was in every way they could think of to annoy the people who lived in the open-air storey above them. There's a magic ring, although Irene's is limited and very specific to her adventures. And in the grandmother, I believe we have the template for Galadriel, amazingly enough. In her bedroom is a bath that appears to be the antecedent of the fountain in which Frodo & Sam see bits of the future. The princess looked, and saw a large oval tub of silver, shining brilliantly in the light of the wonderful lamp. 'Go and look into it,' said the lady. Irene went, and came back very silent with her eyes shining. 'What did you see?' asked her grandmother. Add to that her whole mien, her wisdom & beauty that are almost as frightening as comforting, which speaks to what would later be Tolkein's elvish. Read today, her introduction feels a bit sinister. A magical old woman, in control of who can see her and who can't, who has intense interest in a particular child. I was all set for her to be a bad witch, which says depressing things about how wise women are portrayed today. Delightfully, she actually is good and wise. And intriguingly, she keeps her secrets! Her story isn't at all explained at the end of the book, which just left me wanting more. I understand that there's a sequel, The Princess and Curdie, and I'm hoping to track down a copy. Irene & Curdie are both nice enough, very brave & courageous children who make it through some very dark places together, but I really want to know more about that grandmother! Here's another way that you know that a story is good: I told my mother that I was picking up some George MacDonald. She said that she felt like she'd heard the name before. I mentioned Phantastes and Lilith, but when I mentioned The Princess and the Goblin she lit up. She proceeded to tell me the whole story, which she'd loved as a girl in the 40's. I was mildly put out, since I thought Mom and Dad had read all the good English children's lit to me growing up, but apparently they missed that one. No matter, it just gives me the opportunity to discover it now, when I can appreciate just how much it relates to the genre as a whole. Chalk up another one in the "delightful!" column of the classics roster. Voyage to Arcturus (1920) is completely different from anything else I've read during my journey through the genre’s classic history. It feels allegorical, but it’s rather more subtle than, say, Pilgrim's Progress. It shares its structure with Utopian literature in that it takes a man of (approximately) our times and places him in a strange world where other people have to explain things to him. In Looking Backward by Edward Bellamy, this involves the explication of an single comprehensive political/social/economic system. In Arcturus, things are more complex: the protagonist Maskull travels to Tormance, a planet orbiting Arcturus. He doesn't just talk with one set of people there, he talks with many. As he travels through the landscape he meets different people with diverse philosophies and physiologies. His own form changes several times, growing and losing new sense organs with a(n alarming) rapidity that he takes calmly in stride. In its depiction of a man wandering through diverse encounters, it puts you in mind of Gulliver's Travels. But Maskull's encounters are not directly satirical—neither are they straight-forward allegory. The names of people and objects are faintly evocative, though only enough to produce a shade of meaning in the mind. There are no well-marked sign posts for the philosophical positions that the figures represent, and I’m afraid most of the references went soaring off over my head. To me the most interesting thing about this piece is how it shows off the potential that science fiction would grow into. Maskull travels (via handwavium) to a distant planet. He meets people that he doesn’t immediately try to kill. He learns from them and changes (both literally and metaphorically) through these encounters. The planet on which he lands has people of alien biology (tentacle arms and different sense organs) and alien physics (new colors, a technique that Lovecraft would also use to indicate alienness), but no monolithic culture. As Maskull travels he meets people living their lives in diverse ways according to different principles. The philosophical areas touched on by the story are wide ranging; I only caught a fraction of what is there. The issues raised include: good vs. evil, men vs. women, free will vs. nature, creator gods and destroyer gods, as well as many subtler points. The story’s structure is in one way straightforward, with Maskull traveling between regions and talking to the different people he meets. In another way it is complex: in each new place Maskull unlearns things he learned before so that he can move forward. In the end he unlearns even his own identity. Thus the story wraps an interesting loop with itself, tying its ending back to its beginning in an intriguing way. I like this book quite a bit. It is readable even at its oddest moments, and the descriptions are particularly vivid. I did not find Maskull’s reactions to events to be particularly believable, but he is not meant to be an Everyman character. While much of the characters’ oblique dialog went over my head, even just skimming the surface indicated the depth below. This is another book that I want to re-read in a few years. I had the same feeling after finishing Chesterton’s The Man Who Was Thursday. Since then I’ve laid my hands on a edition annotated by the incomparable Martin Gardner. 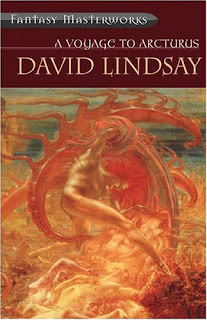 Gary K. Wolfe has written a (short) volume on David Lindsay, so perhaps I will try Arcturus again after tracking down a copy. It happened sudenly. The Artificers set down the jar and tiped it over. The swarm spilled out like glittering, jeweled honey, their tiny legs clicking against the wood as they washed across the stage. They climbed the girl and began to nest with her, become her, entering the secret machines that made up the engram. They were seeking their queen and her pattern, the song stitched into her shell and her memory, awaiting birth and creation. The girl shivered, and she became. Much like the Remade in Mieville, people in this universe can be extensively modified for various tasks—and it’s not pretty or pleasant. The girl in the above passage is a performer; later that same artifice will make her a demonic assasin. Our hero has been extensively modified to be a zeppelin pilot, although he was only a passenger on the doomed Glory of Day. The technology used to do this is equal parts alchemy, genetic engineering and steampunk machinery; things with mystical symbols, bred to encode them, whirring with gears and metal. It seems like an excellent entry point to questions of identity and exploitation. However, in Akers’ debut novel the story settles too easily into the rhythm of the thriller plot. Once the narrative starts down that path, nothing diverts it from its prescribed course. It hits all the beats: Jacob has a macguffin, which he doesn’t understand; there are different factions competing for it; Jacob doesn’t know whom to trust, but picks up a love interest and a sidekick; after much frantic activity, he finally comes to a moment of understanding; quickly followed by the resolution. This is all well done—it’s fast paced, easy to read, the narrator (first person) is sympathetic, the love interest and sidekick are easy to like. I just couldn’t shake the feeling that it could have been so much more. The imagery and world-building suggested many more layers, but none of them were illuminated by the plot. These hints resurface once more during the Moment of Revelation, but by then it’s too constrained by the needs of Plot to spare time for Theme. That said, this thriller is unflinching. Aside from the graphic violence, the narrator is given the opportunity to make a really difficult choice. Unusually, the author keeps his fingers off the scale that balances one side against the other. The hero also suffers real consequences for that choice, which is itself refreshing. 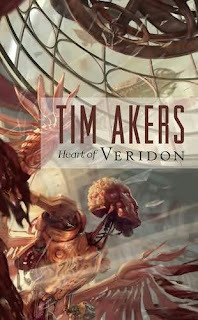 Still, without the world-building aiming to add depth to the themes suggested by the excellent imagery, I felt that Veridon didn’t quite live up to its potential. However, the simple fact that it has that much potential bodes well for Akers’ next effort. I’ll be looking forward to it. Full disclosure: Why did I pick this book to read? I met Tim Akers at two cons this year, introduced by another relatively new writer, Daryl Gregory (see full disclosure on my review of Devil’s Alphabet). I knew Tim had his first book coming out this year, and when I saw it on sale at the World Fantasy Convention in San Jose, I made sure to grab it (although I neglected to get it signed, whoops). I finished the book I brought with me, and needed something to read on the plane ride home. As it happened, Heart of Veridon was the only mass-market paperback that I had out of all the pounds of books I got at WFC (Curtis and I shipped quite a few books home). So I grabbed it for plane reading, and enjoyed it enough to finish at home. The cover art didn’t hurt either. Quite striking, and it actually gives some useful indication of the book’s content. At first I thought it was a Martiniere, but the artist is actually Jon Foster. Charles Fort’s work is the foundation of a movement of the quirky that survives to this day. Forteans, especially as manifested in the Fortean Times magazine, live in the great grey area between hard scientific skepticism and bozo bonkers true believers. The main thing to keep in mind with Forteanism is that there are lots of things out there that science hasn't explained yet. Sure, many of those things are "trivial," but that doesn't mean they should be dismissed out of hand. So as long as folks keep noting and recording the odd things that the world keeps kicking up (falls of frogs, moving glowing lights in the sky, ball lightning, hauntings, visitations) maybe someday someone will pay attention and we'll all learn something about the universe. Fort was the first to start collecting hundreds upon hundreds of these tidbits--damned data, he called it. They certainly didn't fit in with any understanding of the universe promulgated by early 20th century scientists. 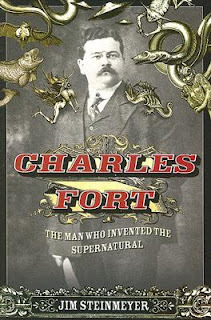 In Charles Fort: The Man Who Invented the Supernatural, Jim Steinmeyer gives us an interesting portrait of the man who came up with all this stuff. What he wisely leaves ambiguous however, is the question: how much of this stuff did Fort actually believe? The most important thing that emerges from Steinmeyer's account is that Fort was, at heart, a geek. He may not have started out as one; his youth was marked by a horribly abusive Victorian father in New England. He took off as soon as practicable and worked as a journalist. He traveled around the world on very little money in order to build up his cache of experiences, and for a while was considered an emerging American voice in short stories. It was during that period that he met up-and-coming Great American Novelist Theodore Dreiser, who as an editor took Fort under his wing. However, Fort took a turn for the eccentric and gave up on short stories. He started spending all his time in the New York public Library, collecting research for non-fiction books. He destroyed all the drafts of one that he was unable to sell, but eventually with Dreiser's help he published four volumes: The Book of the Damned, New Lands, Lo! and Wild Talents. He had stacks and stacks of boxes of neat notes that he jotted down during his researches. He also designed complex games and was unsociable. Today we'd probably class him as OCD, at least to some degree. He always had at least a little money coming in from his father's estate, but it was rarely enough to live on in comfort, at least not in New York City. He and his wife sometimes lived in slums, and she often had to work as a maid or laundry woman. Eventually he succumbed to cancer in late middle age, while absolutely refusing to see a doctor. He postulated some wild theories in his books, including floating islands in the upper reaches of the atmosphere (where the fish and frogs were falling from, you see). Did he believe that, or was he trying to provoke a scientist somewhere into taking this stuff seriously enough to refute--and thus get an actual explanation? Or some other motivation? He didn't leave any journal of his thoughts, although he did write a partial autobiography. In the end, even Dreiser (who tended towards a rather worrying credulity and seemed to believe a lot of this stuff prima facie) couldn't tell. Steinmeyer wisely refrains from fruitless speculation. However, Fort’s legacy continues to be a fruitful one. I find Forteanism to be a more humane approach to the world than the American brand of skepticism practiced by folks like Michael Shermer and magazines such as Skeptic. While I personally tend to believe that all these odd phenomena have mundane explanations, I refuse to label all those who experience them as deluded ignorant morons. Science hasn't explained everything yet, and sometimes the data on the margins of the graph are what lead us to broader understandings. I also found the skeptical magazines to be terribly repetitive, making the real world seem an awfully boring place. Thus, when I was about 23 I switched my subscription loyalty from Skeptic and Skeptical Inquirer (both American) to the much more good humored and inventive Fortean Times (based in England). My image of Forteanism is so associated with England, by the way, that I was surprised to learn that Fort was born in America, lived in America almost all his life, and spent only a few months in London (where he of course spent much quality time with the British Library). Steinmeyer's biography is a quick and easy read, written in a journalistic style. It feels thoroughly researched, and he seems to have a real fondness for his subject. It's also an interesting tangential look at the publishing industry in New York in the early 20th century. I'm not sure that this book will necessarily appeal to people who don't already have an interest in Fort and his legacy, but for those who do this will prove a worthwhile investment of reading time. 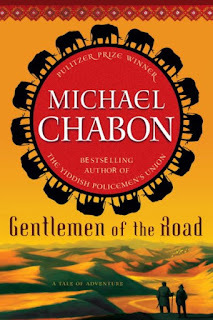 Gentlemen of the Road is different from any other Michael Chabon book that I've read. It's quite short, it's historical, and it's a pure adventure story. In it, two unlikely companions get saddled with an annoying young prince and must return him to his homeland. They go from being charming rogues to stepping up and helping with matters of power and governance. Along the way they get into and out of scrapes and experience plot twists. It couldn't be more different from the contemporary angst of Wonder Boys, the near-past character drama of The Adventures of Kavalier & Clay or the alternate history musings of The Yiddish Policeman's Union. Give Chabon props for not being repetitive! Unfortunately, however much I've loved Chabon's other writing, Gentleman failed to impress. There were a few things that I was hoping for from this story, based on Chabon's demonstrated talents, that I didn't get. For a short, almost pulp adventure story, I was hoping for something a bit closer to a page-turning romp. However, the pacing was slower and more deliberate than I'd have liked to see. Several scenes seem to over-stay their welcome compared to what you'd get in a rip-roaring adventure, and it seemed to take too long to get everyone from A to B. The advantage of that decision would come if it gave Chabon more time to show off his clever, sparkling prose and his unique way with similes. However, that snap was also lacking: I felt that the prose in this book was actually duller than that of any of the other books of his that I've read. Very few memorable lines or passages stand out to me. If I were more conspiracy-minded I would think that he'd deliberately dumbed things down because he felt that adventure tales have to be pitched to a lower grade level. Given all that, the fact that the characters never seemed to gain their third dimension left me entirely underwhelmed by the enterprise. While the whole set-up is a fascinating one (being, as Chabon has put it, a basically historically realistic tale of "Jews with swords"), the fact that none of Chabon's strengths came to the fore left me disappointed. It's a pleasant enough read that doesn't try the reader's patience, but it's definitely not what I was hoping Chabon would bring to the historical adventure genre. If you’re looking for a rip-roaring adventure of past times, I’d recommend re-reading H. Rider Haggard’s King Solomon’s Mines instead.